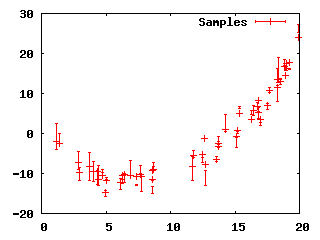 Note: This tutorial assumes you have basic familiarity with both Gnuplot and the Python programming language. Without some understanding of those, you're going to be quite lost. At some point, it is bound to happen. 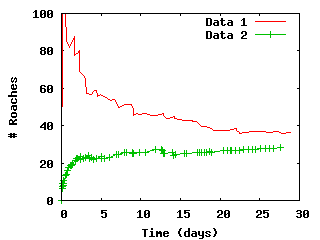 Gnuplot is wonderful, but there comes a time where it just doesn't quite have the power that you need it to have. 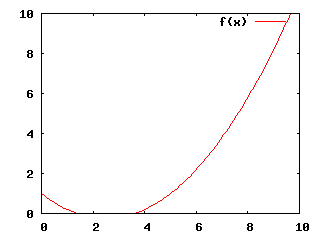 Perhaps you want to radically alter the way the axes are drawn. 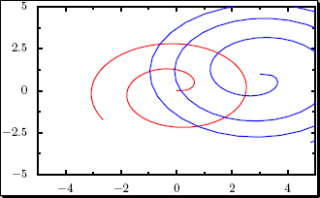 Perhaps you just want to do something simple like change the color of a plot line, but not the pattern. Maybe you really need some hefty math symbols displayed on the graph. At some point you'll hit the wall beyond which Gnuplot quickly stops being the right answer. What works better in these situations? There are many answers. HippoDraw is powerful and free, although relatively unknown. Some people like XGraph. If you, like me, are a Python programmer, then you might be willing to go for a less user-friendly but more controllable solution. If so, then PyX (Pronounced "Piks") is one possibility. As of this writing (January 2006), PyX is still pre-release software. Advertising a version of 0.8.1, there are definitely some rough edges on this. Usage of PyX may very well require some significant poking at the Python objects that make up the PyX framework. However, I can attest that this is time well spent: it took about 3 or 4 hours to go from first installing PyX to generating graphs that were (in my opinion) greatly superior to what I could have gotten out of Gnuplot, my normal go-to for graphing. 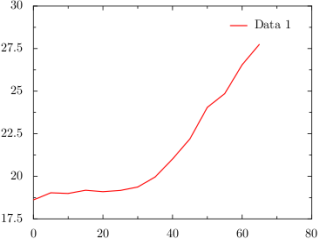 Probably the most common thing to do in Gnuplot is to plot a simple data file. (Sample data files are available here and here). How do we do the equivalent in PyX? This depends on how equivalent you want to be: the defaults in these two environments are different. 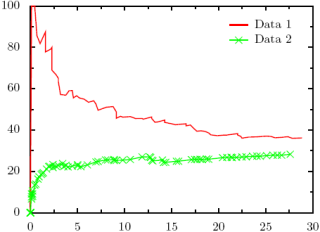 So we'll first show the simplest graph for the same available in PyX, and then follow with making the graph look like the Gnuplot equivalent. Note: PyX does not have any display capabilities, so you'll need to write to PDF or EPS and then use you favorite viewer for those file formats. 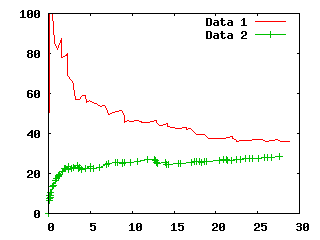 Color - Gnuplot defaults to printing the first plot in red, the second in green, etc. (BTW: This is unfortunate for the ~3% of the population that is Red-Green colorblind.) PyX defaults to black and white. 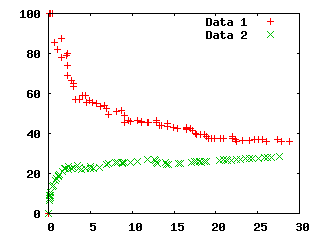 Key - Gnuplot defaults to rendering a key for each line in a plot, PyX does not. Now we shall address these, one at a time. gnuplot> plot "data.dat" title "My Data"
Note: Text in PyX is being typeset by LaTeX. This has advantages and disadvantages. If you wish for your title to include math symbols, Greek characters, etc, then simply enter the correct LaTeX formula. On the other hand, if you want to use the "%" sign, be careful: that is a comment in LaTeX and thus you will cause some significant confusion to PyX. Another thing to be watchful of is that Python may interpret LaTeX symbols incorrectly: "\tau" in Python is going to be interpreted as "\t" (the tab character) followed by "au". A good solution for this is the "raw string" feature in Python: preface your strings with 'r': r"\tau", then no escape character expansion will be performed. 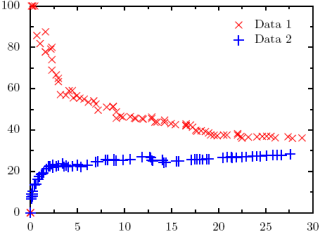 OK, so we can mimic a simple, single-plot Gnuplot graph. Moving on to multiple plots. 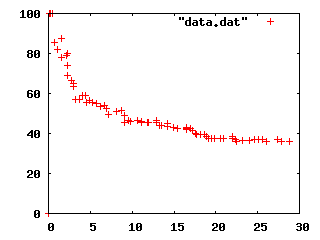 gnuplot> plot "data.dat" title "Data 1", "data2.dat" title "Data 2"
# These are the data lines we want to plot. 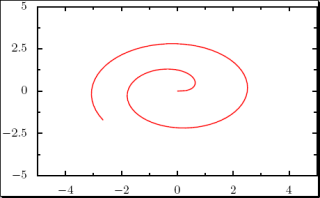 How about changing plot styles from points to lines or linespoints? This gets a little more complicated, but not too bad. We return to plotting one line at a time. This is not the most simple invocation for doing this (I'm adding in a few extra options), but I am taking this opportunity to show off a few extra features that you ought to be able to generalize from. Adding error bars in PyX is quite easy, and gives you much greater control over how the points are drawn (with or without symbols, different color error bars vs. symbols, size of symbol, etc). This section uses this as a data file. 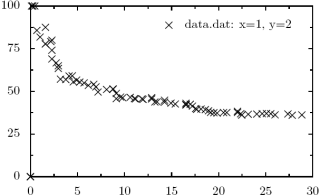 plot "error.dat" using 1:2:3 with yerrorbars title "Samples"
Again, common and easy features in Gnuplot that turn out to be almost as easy in PyX. 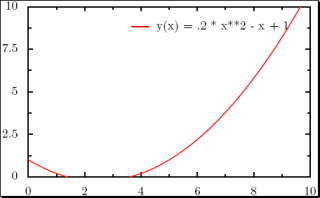 Lets add labels to our graphs so we know what the axes represent. 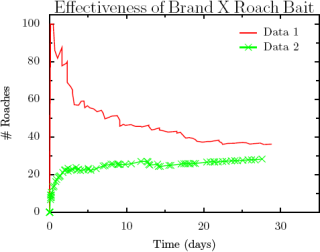 gnuplot> set ylabel "# Roaches"
gnuplot> set xlabel "Time (days)"
And the equivalent in PyX. The only thing to watch out for here is the calls down to LaTeX. How about if we want to bump the ranges for the plots a little? Again, in PyX, very easy. 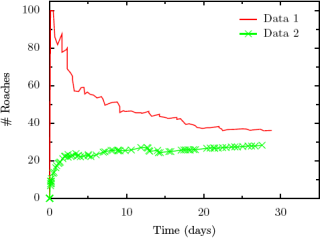 Definitely one of the least-elegant Gnuplot-equivalents for PyX, adding a title to a graph is actually making use of PyX's capability to add text anywhere on a graph. Don't like the default key? Make a new one. Want to add labels right onto a graph? Do it. Don't want vertical text for your y-label? Do it by hand. The ability to typeset text right onto your graph can be very handy, but that comes with a price: it is a little clunky from time to time. 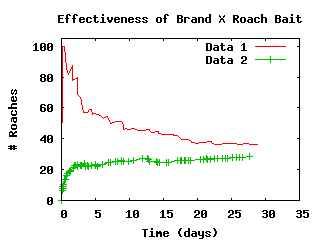 gnuplot> set title "Effectiveness of Brand X Roach Bait"
plot "data.dat" title "Data 1" with lines title "Data 1"
The equivalent in PyX is easy if you've been following along, although certainly more typing. 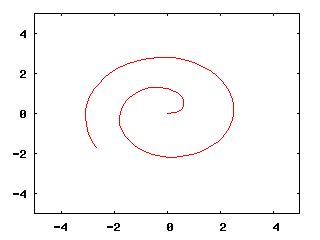 In PyX, we start to see some of the power of Python showing through. 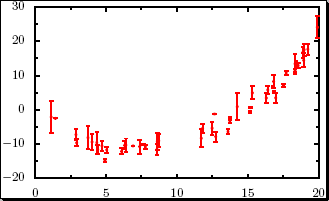 With sufficient linear scaling of the parametric value, Gnuplot could be coaxed into plotting a graph like the one above. Well, that just about does it for basic Gnuplot usage. On the other hand, that barely scratches the surface of PyX. 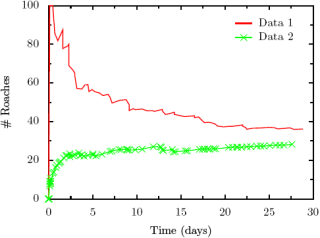 With the demonstrations provided you ought to be able to convert any of your old Gnuplot plots into shiny new PyX plots with relative ease, and probably make them much nicer in the process. One major benefit here is that PyX is really Python, and thus you can (and should!) write functions, loops, conditionals, etc when handling large plotting tasks. This way you can greatly reduce the amount of code required to generate your graphs. Plus, PyX gives you much greater freedom for changing line styles, axes, and more. Labelling is a powerful feature. 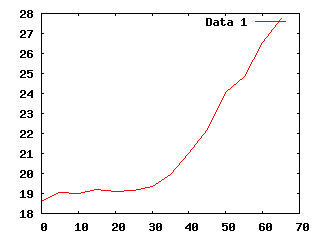 Take a while to explore PyX (sadly, the Python interpreter is the best way of doing this), and see just what new uses you can come up with that you would never try in Gnuplot.